"This salad tastes great and packs a super nutritional punch! Try it with any dressing, but my favorite is a fat free roasted garlic vinaigrette." 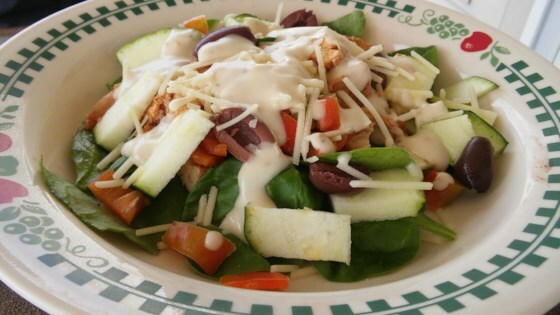 Great salad flavors baked into chicken breasts! This was really good. I subbed parmesan for the fontina and I used a fresh garlic ceasar dressing. This made a LOT of salad, it made 6 servings for us. This is a nice mix of veggies. I used parmesan cheese and Caesar dressing. It was a filling salad for dinner.